Discipleship is the lifestyle of walking with God. As church leaders, we need to give followers of Jesus a pathway to walk as they become more like Jesus and advance His kingdom. 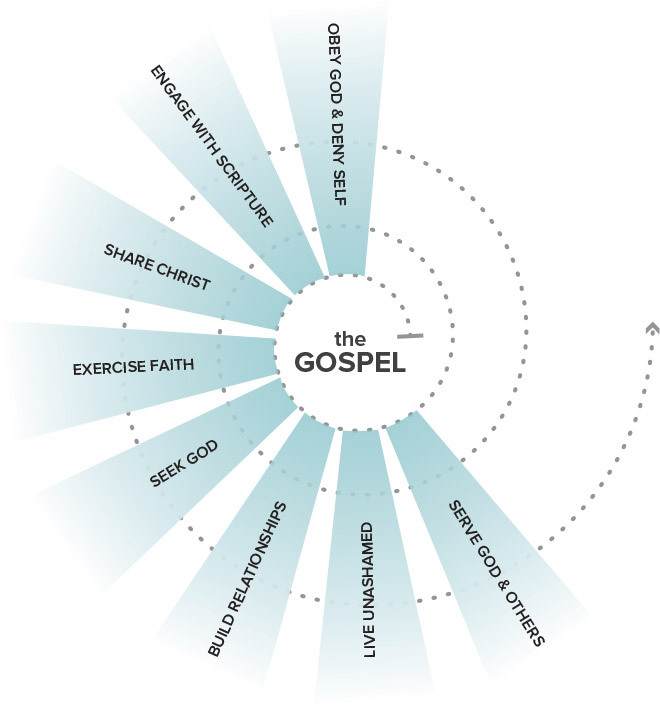 This pathway is built on three characteristics: centered on the Gospel, expanding in scope, and displayed in real life. Every pathway has signposts—markers to show a person’s progress on the pathway. LifeWay research has identified eight signposts of discipleship. These are lifestyle patterns that ought to be growing in ever-increasing measure the longer a person walks the pathway of discipleship. Get a free copy of the new Creating a Discipleship Pathway ebook. Discipleship is the process of obedience to the One who is in authority over us. Transformation can be seen when we progressively set aside earthly delights for kingdom priorities. Resources in this category push disciples into a greater understanding of their identity in Christ. When it’s the Bible that sharpens our minds, shapes our perspectives, and directs our actions, spiritual maturity naturally follows. Resources in this category facilitate transformation most directly through Bible engagement. Inherent in being a disciple of Christ is the making of other disciples. Transformation is evident in believers as they verbalize their faith and talk with others about the source of it. Resources in this category offer a greater sense of evangelism, elevating the command to go forth and make disciples of our neighbors and the nations. Transformation is seen in believers when risk-aversion is set aside and our lives are characterized by faithful obedience to God's will. Resources in this category help believers in areas of faith and trust that God will finish the work He has begun. Transformation takes place when our desire is to know God more deeply and experience His work more fully. Resources in this category are intended to drive group members into a deeper relationship with God. Our horizontal relationships should develop just as our vertical relationship with God does. Transformation is occurring when relational maturity is evident in our lives. Resources in this category focus primarily on the redemptive aspects of community and how to root relationships in the gospel. Transformation is evident when believers are unashamed in presenting their own lives as being aligned with Christ. Resources in the this category will help believers lead lives that will attract others to Jesus. Transformation is evident when personal needs and even dreams are set aside for the needs we see in others. Resources in this category espouse a deeper resolve toward missionality.